Contemporary, Modern, rustic Slab custom conference Tables handmade in montana and shipped worldwide. Many custom confernce tables in stock and on sale. Call today. Custom cherry corporate conference table with boat shaped top. We build custom conference tables in our solar powered Montana wood shop using recycled and reclaimed hardwoods. We have a large inventory of huge slabs from around the USA. 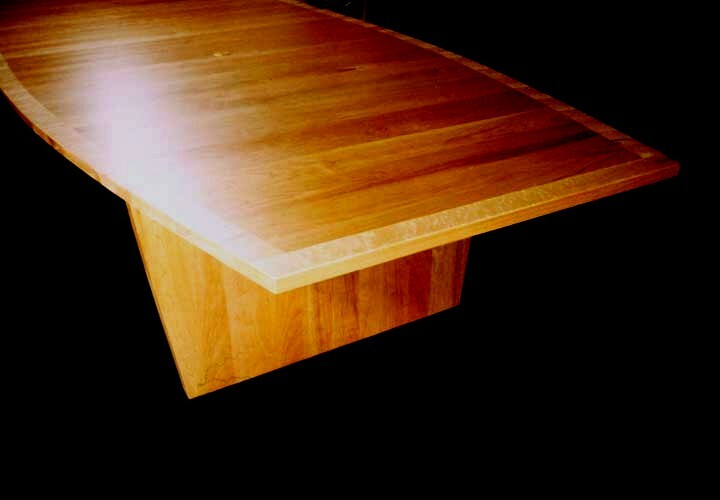 Large Custom cherry corporate conference table with birdseye maple rim – detail of table edge. The McDonald curly maple slab rustic custom coffee table with 4 drawers has ebony butterflies and shaped legs. Great storage for remotes, CD’s, VHS tapes, books, magazines. Keep the clutter off the top of your beautiful table!